We’ve been in Tasmania about three four weeks now, and it’s about time I bought this up to date, and posted a few notes and photographs about the journey. 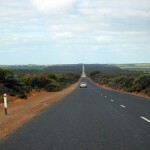 We drove more than 3,000 kilometers in 5 days, to cross from Western Australia through to Victoria via South Australia. From there we caught the ferry across to Tasmania. The drive was largely uneventful (all in all, a good thing).